The fact that the best risk quotes I could find are from Kanye and Edward Snowden should tell me something. In any case, I recently received a text from an artist friend1 who, in addition to teaching me what I should be looking for in the stock market,2 let me know that he’s “in some private equity stuff which is removed from the daily tweets.” I thanked him for the help and let him know that if he would just agree to lock up his money with us for ten years, I’d return the favor by sending him statements valuing his investments at either their cost, or whatever I thought it they were worth – that is until we settled out in the end. But we don’t get to play by those rules (and if we did, we’d have a lot more competition). And so, while we’ll get to the usual discussion of our portfolio and performance later, we interrupt this diatribe to provide the latest update on the prospects for Elm Ridge as a mainstream institutional business. Where do we fit in a world where agents are hoping to avoid reporting any inconvenient setbacks, before having “made off” with as much as possible before it all comes undone? We first need to acknowledge that since the Fed started targeting equity markets and lowered the hurdle for interest rate suppression with QE2 in November 2010 (after all, QE1 was a response to a real crisis) our returns have, for lack of a better word, sucked – knocking our long-term annualized performance down by two-thirds. With the Fed hard at work in service to its most attentive audience (Wall Street), yield-dependent investors have been forced outside traditional fixed-income into new Madoff-lite (higher than risk-free rate returns with minimal reported volatility all in return for a little unmentioned tail risk). As a result, the same factors – stability, yield, leverage and dependable growth – have driven returns for nearly a decade and sent value investors to the scrap heap.3 We’ll leave it to you to decide whether such an extended period of suckitude (to use a technical term) has to do with the fact that: value is dead;4 we’ve become stupid; or at current valuation disparities we could be on the cusp of the kind of market upheaval we saw when we first launched Elm Ridge. Either way, interest rate suppression has clearly had a major impact on how the equity investing business is now conducted. When Elm Ridge was getting off the ground almost twenty years ago, our first investors were wealthy individuals (who played a major role in investment decisions rather than farming them out to professional agents) and a few endowment and institutional investors who had been investing in hedge funds for some time. To an investor, they partnered with us either to diversify away from, or to prey upon, the active growth mutual fund (and institutional account) complexes that then dominated the investing scene. But as trends changed and the former favorites got shellacked, hedge funds became all the rage. New agents representing the state and public pension funds sold their clients and/or investment boards on the expectation that they could generate equity-like returns with a fraction of the volatility. While Bernie Madoff seemed to have best capitalized on this interest, plenty of other funds rode the emerging China and strong housing themes to some rather consistent strong returns. By 2006, we thought it was time to play for the other side, moving out of the commodity-based investments that had done so well for us and getting our first lesson in the costs of straying too far from the investment herd. As our positions challenged the prevailing narrative and our performance lagged (the HFRI index returned 11.7% v. our 6.9%), our assets dropped by one-third during that year alone. Of course, that group wisdom unraveled during the financial crisis (where we returned more than 35% net from 2007-2009, with the S&P down more than 15% and the HFRI barely above flat). But from that point, as the Fed reacted to every new real and imagined threat with more interest rate suppression, most institutional investment agents needed to square their 7+% return assumptions with a sub 2% risk free rate and a client base (e.g. investment boards for many pension and endowment agents) abhorring any reported volatility. And voila, they needed a new Madoff – figuring that if they just lopped a few points off their return expectations (mirroring the fall in the risk-free rate), they could somehow get a legal free lunch. There seems to be three basic approaches to producing higher returns without the inconvenient drawdowns that would naturally accompany them. First, we have private equity, where reporting standards are not burdened with any mark-to-market irritations and one can anchor on historical returns further boosted by an almost continually decreasing cost of funds coupled with increasing exit multiples. In fact, we would urge you to read both AQR pieces cited below,5 the latter of which demonstrates that you could basically replicate PE returns by just buying a levered small-cap index – except that you would lose the “return smoothing” (and we would add career enhancing) properties that would otherwise accompany the added risk of illiquidity. Second, investors can ignore what might be extreme longer-term risk by levering usually (“usually” being the key word here) dependable income streams to meet their or their clients’ higher return needs. There are several avenues here. For instance, they can invest in or alongside all the new non-bank lenders,6 that are extending credit to riskier borrowers. Indeed, investors seem more than willing to take on increasing risk as long as it doesn’t add to reported volatility, as shown by the increasing issuance and leverage ratios across BBB credits.7 Moving along the risk curve, there has been an explosion in leveraged loans that more than doubled in the past decade, and now exceed the public high-yield market. Even worse, CLOs (slicing and dicing just like in the Big Short) are gobbling up just over half of these, in their effort to avoid their low yields, with the Japanese taking most of the rest.8 Meanwhile, other manufacturers of yield can invest in those REITS who are selling assets and shares to support yields greater than the cash they naturally generate. Or one can buy shares in those companies that generate earnings through financial engineering, who can continually grow “adjusted” profit measures by adding low-cost (at present) leverage, leaving a smaller margin of error with each new corporate action. Third, investors can ride momentum, one of the best predictors of short-term performance – that has the added benefit of allowing its promoters to regularly appear quite prescient in the periods when agents are still evaluating the merits of their approach. (It seems that some famous TV pundits have done rather well capitalizing on this factor as their audiences remember when their suggestions pay off in a convenient time frame and forget when they blow up months later.) Momentum seems to play a key role in quant investing, and active managers have taken notice.9 We now need to spend more time predicting how non-cash and purely accounting-related maneuvers (pension smoothing, excluding amortization, etc.) will affect the earnings numbers that feed the machines. One feature all these approaches have in common is negative skew. They may not go bad often but when they do, they do so in a big way. This feature might appear acceptable to agents who think about risk in terms of volatility but we’re much more concerned with avoiding unrecoverable and life changing losses of capital. I remember a fixed income team at a former institutional employer who sold themselves on their consistently beating their benchmark month after month, leaving their customers and bosses in awe. Of course, they achieved this alchemy by merely avoiding the lowest-risk, lowest-return treasuries that only proved their mettle when fear took hold. And then came 1998. Playing all three negative skew avenues does not really dampen the risk of permanent loss. They all currently depend on the same phenomenon: the low interest rates that directly fuel the first two and a decent share of the momentum cohort as well. Negative skew ought to scare the underlying owners of capital (like my artist friend), but, perversely, this property is probably attractive to both the professional investors and the agents who support them. If these folks leave the herd too early, they are incurring serious career risk. But if a sizable portion of their industry goes over the cliff at the same time, they just recompete in the employment musical chairs that they were destined to encounter no matter what they did in anticipation. One might argue that if we had any common sense (or I had less than 70% of my net worth invested in the fund), we would have learned this lesson earlier, as we too experienced redemptions on the order of 30% of assets in the first half of 2009 despite the positive and dramatic outperformance that we referred to above. Indeed, it appears the imperatives of Bernie’s II have changed how investors treat value stocks in general and energy, in particular. As we have argued before, value stems from “new” developments that polarize the market as investors steer clear of controversy and complexity. It works over time because of mean reversion (“is’s” are different than “shoulds”) and amplified payoffs. The strategy’s downfall is that mean reversion doesn’t occur at convenient time intervals, leaving value investors playing for change sometimes well before it happens. And in this current cycle, we have the Fed out to forestall any threats to the current investment regime and a Bernie’s II investor base dependent on its continued success. While we think we have uncovered a portfolio of stocks selling at under 5x their normal earnings, our compatriots don’t really see an acceptable tradeoff between the rewards of outsized returns versus the job-threatening costs of falling behind as they wait. Unfortunately, we didn’t realize we were in a new world at the end of 2014 when we first began to build our energy book. While we didn’t expect an immediate rebound in prices at that time, we thought the capex cuts that were first getting announced would lead investors to understand that prices should once again reach the levels needed to balance the market and that our E&P holdings would soon reflect those expectations – as had always been the case before. But after the first failed oil price recovery burned them in early 2015, more and more professional investors learned that it was better for them to just steer clear – with the stocks now lagging subsequent recoveries rather than anticipating them. On the other side, we used to have a history shorting “dependable” stocks at the high end of their valuation range that looked like they were playing games to extend their streaks. While we were almost always a little early, high valuations and slowly growing reported profits limited the interim costs before something knocked them off the tightrope. But as leverage has become cheaper and complicit investors are willing to turn a blind eye to balance sheet risk, these seem to be just what the market is looking for. And if these companies run into more difficulty, they can just change their definitions of “adjusted” earnings such that they get the positive revisions that the machines and their “active” acolytes are looking for. For example, I’ll dwell on one sector, defense, that I have covered for some time. Almost all the large primes are reporting a sizable benefit (up to 1/3 of earnings in some cases) from pension income, which merely represents a reimbursement of payments from the DoD that these firms made about five years ago (when we told you that these “expenses” would reverse). While pension income does represent cash inflows, it is due to go away over the next few years as the companies no longer need to top up pension shortfalls. This is not a new phenomenon and the companies used to trade at similar multiples excluding pension earnings or expenses – leaving a much wider variance on the consensus numbers that populated most databases. But since 2016, they’ve now moved to similar multiples on the computer-fed figures, leaving them at wide gaps on the portion of earnings that will sustain over the next five years. Indeed, Northrop was rewarded with a $2 billion bump in its market value just for changing its pension accounting to add $500-600m of non-cash earnings (in total) over the next couple of years. Energy remains about half our long exposure and accounted for a little more than that share of our long gains in the quarter. As we mentioned in January, the futures market for oil and its related products is roughly 30x larger than the physical one, allowing for more volatile swings than those of supply and demand. At the end of the year most experts had dismissed any near-term expectations of $60 WTI, citing seasonal builds in inventories in the first quarter (as refineries are taken offline for maintenance) and a weakening outlook for demand (“demographics, follow demand” the artist texted). Yet few people thought much about what a $30 fall might do to supply. While OPEC led the way with an 800kbd cut, U.S. E&Ps are also slashing investment and expected production growth as well, with current and usually optimistic producer guidance pointing to less than 1mbd of year-end/year-end shale growth, or about half that of 2018. While the slowdown is certainly impacted by the sheer increase in base volumes, we have long argued that US shale cannot keep oil markets properly supplied on its own (certainly not at prices below $65-$70). Our analysis suggests that shale prospects have consistently been overstated by omitting overhead, high-grading of acreage and depressed service prices, that drove companies to devote more resources per well (longer laterals, more sand/chemicals, etc.) than would be sustainable over the longer term. In addition to the impact of lower investments, US shale production is also facing increasing technical challenges; as infill drilling creates interference between parent and child wells, as drilling steadily steps out of the core Tier 1 acreage, as the growth in lateral length and proppant per stage is starting to plateau, and as increased light oil production impacts domestic refining capacity. I’ll relate you back to the comment I made on last quarter’s earning call in November. The issue for the entire Permian Basin relates to parent/child wells. Every year, every company is drilling a higher percentage of child wells and those wells are simply not as powerful as the parent wells. And the reason you analysts may not have picked that up from the people who have reported earnings so far from the pure Permian companies is that most of the pure Permian companies have engaged in M&A activity and so the results that come out are really difficult to analyze… Although the whole shale revolution appears to be quite powerful, if you just look under the hood you find that every company has to run faster and faster to achieve growth because you’re seeing the effect of geology and well interference that is taking a toll. While production lags spending, global first quarter inventory is on track to build at the lowest rate in eight years, with US crude + main products on pace to for just their third first quarter draw in the past fifteen. Indeed, trends suggest that the market is seasonally undersupplied by 300-400kbd, before any recent impact from lost Venezuelan production. The physical market is starting to overpower negative sentiment, with current prices exceeding the futures as consumers pay up for current supply — usually the most reliable indicator of market tightness. The few weak demand figures from November/December look like blips as refining margins have returned to typical levels despite higher crude. And we would expect this positive momentum to continue as demand typically jumps 2.5mbd from 1Q to 3Q, while global supply should be up half that. Yet even with rising prices and a supportive outlook, energy related stocks, while stronger, are nowhere near reflective of current pricing. In fact, since 2016, oil is up more than 10% while the XOP is down more than 25%, underperforming the S&P 500 by 50 percentage points. 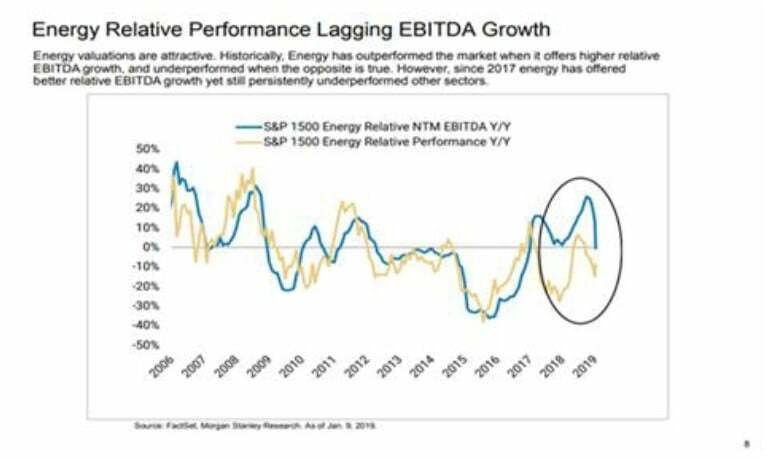 Over this same timeframe, the EBITDA of the S&P 1500 Energy Index has grown faster than the overall market (see chart at right), putting valuations at absolute and relative lows. But three times burned, six times shy. Professional investors have learned that investing in the sector while Bernie’s II reigns is inimical to job security. At this point the original energy momentum investors who encouraged maximizing production growth at the expense of returns11 are long gone, replaced by those who want to see a real return on investment. More and more companies are taking “The Pledge:”12 1) committing to disciplined spending and return of capital to shareholders; 2) providing corporate targets for cash returns; and 3) tying compensation to these targets and other value-based measures. As a result, according to one note,13 E&Ps referenced “FCF” 9 times per transcript, in 3q18 and 4q18, or nearly 3x and 5+x that of 2017 and trailing 5-year average, respectively. This new playbook has worked. The pledgers as a group have outperformed their peers by 40 points since the end of 2016.14 ConocoPhillips (COP), one of our larger holdings two years ago, was one of its early adopters. Its focus on returns over growth has led it to not only outperform the sector (by nearly 30%) but the market as well, by more than 15 points since the beginning of 2018. In doing so, COP became one of those few E&P’s to leave the lowest-valued quintile of our valuation model, allowing us to take our profits and move on. We don’t need the entire industry to commit to the pledge, we just think those that do will reap more rewards, so that’s where we have allocated most of our energy capital. Anadarko (APC), has committed to spend only the cash it generates at $50 WTI, with anything above this level going toward buybacks, increased dividends or debt reduction. Devon (DVN), which has retired 20% of its shares in just the last year, has launched a similar 3-year spending plan with a $46 fulcrum. And while Apache (APA) is still in the process of single-handedly developing a large new play in the Permian, they recently announced that 50% of FCF above $53 will, you guessed it, be returned in the form of share repurchases, dividend increases and debt purchases. We’ve seen this movie before. Although I disagree with how many investors have drawn some rather illogical conclusions from The Outsiders,15 (these eight people did X and it worked, so X must work), I was intimately involved in the episode discussed at the beginning of Chapter 3. General Dynamics changed the industry playbook during the downturn from fighting to win new programs at all costs, to using those funds to buy their underpriced stock. Within just five years years its stock was up close to 10x or a mere 800+% more than the S&P. But just as important, McDonnell Douglas, Lockheed and Northrop followed its lead and outperformed by 500% or so themselves. If valuations do not respond to this newly found discipline, most of our holdings will be able to return enough capital to force the issue (at $70 WTI/ $75 Brent, our holdings would generate an 18% free cash flow yield at their current stock prices) so that the market can no longer ignore it. We didn’t really make any major moves during the quarter. We sold COP as it reached our target price and pared down our large position in CRC after it nearly doubled from the December trough, redeploying those funds into two other E&P’s (BRY and MEG) and have started two new positions outside energy as well, leaving the sector at about the same weight (48% from 45% of capital) that we ended the year. Otherwise, we did scale back some financials as they ran earlier in the quarter (to 22% from 28% last quarter), with materials, industrial and auto-related up a tad to 21% (from 19%). As usual, we were busier on the short side adding 11 new names, covering nine and roundtripping another two. Here, as some cyclical targets rebounded, we did shift the composition of the short book to 43% from 36% in the more economically-sensitive group including: industrials (19% from 11%); consumer discretionary (11%/13%); materials (6%/3%); financials (4%/7%) and tech (3%/2%), while cutting supposedly “safe:” staples (11%/15%); healthcare (2%/6%); real estate (12%/11%) and utilities (4%/3%) from 35% to 29%. Once again, we did particularly well with earnings reports. Only 7 of 29 longs missed or guided down, producing 2% average outperformance on the day of their reports. On the other hand, 34 of 58 did so on the short side, adding another .7% (as they underperformed). Turning to the other statistics we typically report, comparing the consensus 11.3x P/E of our long book vs. the 6.8x figure we calculate implies we are expecting our long earnings to come in some 70% above consensus. Meanwhile, that 2.9x long book P/NEPS (our data here stretches back to 2002) is still hovering at levels we last saw in the first quarter of 2009, just before that measure nearly doubled in the ensuing 12 months. Indeed, when you compare this figure to that for the shorts (the inverse of the ratio stated above) that figure has fallen well below any we have reported save that of the last quarter. Losing our mainstream institutional cred has been exhilarating in a way, as there is no need to pretend we can do something that we can’t. For instance, back in my big firm days, I knew my time was nearly up when I had the conversation recounted above, as my employer thought (as it did with the aforementioned bond product) that we could somehow or other ensure top-third performance every year, just so long as we weren’t trying for the very top. My artist friend’s approach is not all that different than most professionals. Thinking about tail risk is for losers and those who ultimately foot the bill – except that the artist probably doesn’t think that he will be the one footing it. The Fed has been trying to suppress interest rates and supposedly protect investors (that is the professional ones and not those trying to save for retirement) for a decade and there is no evidence that the end is in sight. Inflation has remained subdued, in large part due to a continual reduction in the costs of goods from the move to lower-cost locales, the impact of lower energy bills and of course the Greenspan-induced increased use of hedonic adjustments18 – while services inflation has rebounded back toward 3%.19 These lower costs have fattened profit margins, as investors have successfully kept producers from competing them away. But we’re now seeing reports that some 40% of the S&P is likely to report down earnings this current quarter. And based on the conference calls that we’ve reviewed, in most cases the major culprit is increased costs (while demand may be slowing, it is not yet declining in any meaningful way). Freight, labor, commodities and the price of imported goods are now all moving in the wrong direction. At the same time, our budget deficit is ballooning with no political force showing an interest in reining it in. At some point, the supply of US government paper could just outrun demand, and then the Fed will have lost control. These are meaningful risks and ones we’re not willing to incur without additional compensation. While higher rates would be a huge boon for us, that’s not what we’re playing for. We are aware and wary of tail events, yet we think we can make money in the absence of major upheaval. Oil supplies are already in deficit. We think our disdained cyclicals will generate so much cash in relation to their market caps that they too can become the new safe stocks (just as the disdained defense primes did after the post-Cold War budget declines). According to our estimates, our long portfolio sports an average 15% FCF return, more than 4x that of our shorts. If our expectations come to fruition, then these out-of-consensus outperformers may push just a few investors from the safety of the herd and a game of Prisoners’ Dilemma could well ensue. Not only that, as higher energy prices filter their way into producer ones (e.g. freight), inflation and interest rates could indeed turn as well. Meanwhile, on the short side, we are not targeting every company playing the leverage game. We’re taking aim at those whose debt has already reached extreme levels at the same time the commercial winds at their backs might now be reversing. The Outsiders might have chronicled how eight CEOs used leverage and stock buybacks to produce great shareholder returns. Yet it ignores what we would guess to be the hundreds who bought well beyond the point when their shares were cheap, or became too levered, and whose stock prices plummeted when the macro environment suddenly changed. These past few years have tried all of us. But our process gets a systemic boost from the fact value’s business-busting (that is for the professionals) cycles keep its demonstrated long-term outperformance from being arbitraged away. From our point of view, we’ll need to double our long-term performance to make it all worthwhile and the 3+x (yes, we are using “x’s” rather than “%’s”) average expected return we calculate on the long side indicates that we think we can do that. Our research team is committed to sticking it out. While we’re looking at our high-water mark from the vantage point of a vampire squid, we recognize that our partners have stuck with us and we won’t pull the shutdown-and-restart game that would leave us with the bends. While Elm Ridge will clearly not work for any agents trying to stay on the bucking bronco by reporting steady, above risk-free rate returns – nor for those ultimate owners of capital who believe such return streams are indeed possible – we think we are poised to provide much better risk-adjusted long-term gains for those who recognize the huge opportunity off-limits to the herd. We’re still here and would love to talk to any folks who might feel the same way.